Everybody wishes for a clean kitchen. In an asian kitchen, the elusive dream is to have one that does not have oily surfaces and oily fume filling it everyday. The amount of work that goes into cooking a meal in a typical asian kitchen can be daunting : the amount of chopping, cutting and cleaning; followed by the frying and cooking; and then the cleaning up of the aftermath. Not only the kitchen gets dirty and oily, the person cooking needs a thorough wash from head to toe too. No wonder so many people are reluctant to cook. In the past, people don’t have much of a choice. Due to cost-consciouseness during a time where money was hard to come by, and the lack of alternatives, most people had to cook whether they liked it or not. These days, with greater affluence and proliferation of all kinds of eateries, more people are choosing to eat out or buy take-out to keep their kitchens clean and their work simple (or non-existent). Of course, there are those who just can’t cook. Like most people, I don’t like cleaning up. I learn to take short cuts to minimise the amount of cooking-related cleaning I have to do. For instance, instead of mopping the floor after cooking every meal, I find a large cardboard box, like the kind refrigerators or washing machines come in, cut it open so I have a large, flat piece, and lay it on the floor next to the stove whenever I cook. I line the counter top around the stove with newspaper too. Now, this can be a bit of a fire hazard, so if you are planning to do the same, please make sure you do not leave your stove unsupervised! Instead of inheriting a tradition from your mothers blindly, examine whether it is really necessary or not. I know there are people who do not cook “cleanly”. A lot of older folks love to cook like their lives depend on a very hot stove, a very hot wok, lots of steam, fume, hissing and splashing. I always know when my neighbour downstairs is cooking : I can hear her wok banging, oil splattering, and I can actually see her cooking fume coming out of her kitchen windows, drifting upwards and into my kitchen. I have to close all my kitchen windows whenever she cooks. I can imagine how cooking a meal can dirty her kitchen, make her walls and floor sticky with oil. If she is the clean sort of person, then a careful mop down of her kitchen is absolutely necessary for after she finishes cooking a meal. On the other hand, there are people who are determined to cook so cleanly that they would not cook anything that requires a stir fry or deep fry. Boiling, stewing and steaming only. I kind of fall in between. I do a fair amount of boiled, stewed and steamed stuff because they are ‘clean’. Yet I cannot imagine myself eating only raw, boiled, stewed or steamed food all the time. I love to eat. It is also boring for a person to only cook by boiling, stewing and steaming. What this means is that there has to be some kind of a compromise. I don’t deep fry that much but I don’t avoid deep frying. It is a known fact that fats makes tastier food. My mom’s philosophy is this : better to deep fry at home once in a while, then to not deep fry at all because you will then resort to only eating deep fried food outside which are a lot less healthy. First of all, you don’t know what kind of cooking oil is used. More likely than not, it is the cheapest palm oil. Palm oil does not stand out as a healthy food option. Secondly, you do not know how long they use their oil. It is unhealthy to use the same oil over and over again. But people selling food to you will not care. If you allow yourself to deep fry food every once in a while (not all the time), you are in control of the type of oil used and you are not likely to reuse the oil over and over again. In the end, you get better tasting food due to the fresher, better oil, and you also end up eating a healthier version of deep fried food. Without being deprived of deep fried food at home, you are less likely to indulge in it when you eat out. Better to sacrifice the clean kitchen ideal for health. 2. It is a lot less oily than the traditional method. The oily cooking fume is a lot more contained if you use a deep fryer and keep the lid closed. The steam comes out but not so much the oil. So all in all, it is cleaner. Cleaning the deep fryer is another issue altogether. Still, it beats mopping down the whole kitchen. So it is a misconception that the deep fryer is not worth the money and the trouble. If you want to deep fry at home, I would recommend using a deep fryer. At this point, I should clarify that when I say ‘deep fry’, I do mean it in the traditional sense. In other words, it means cooking food by submerging it totally in a large amount of hot oil. Then there is pan frying, where you use a modest amount of oil in a pan to fry your food, such as patties, without submerging the food completely in the oil. The way to cut down on damages from pan frying is to reduce the wetness of the food. E.g. if you are pan frying a fish, then use a kitchen paper towel to pat dry the fish first. Wetness from the food will cause an excessive amount of oil splattering and steam. Secondly, as much as I can, whenever I pan fry something, I will cover the pan with a cover. Obviously, when the pan is covered, oil splatter and steam cannot get out to dirty the surrounding area. Secondly, the covered environment keeps the heat in and cooks the food faster. 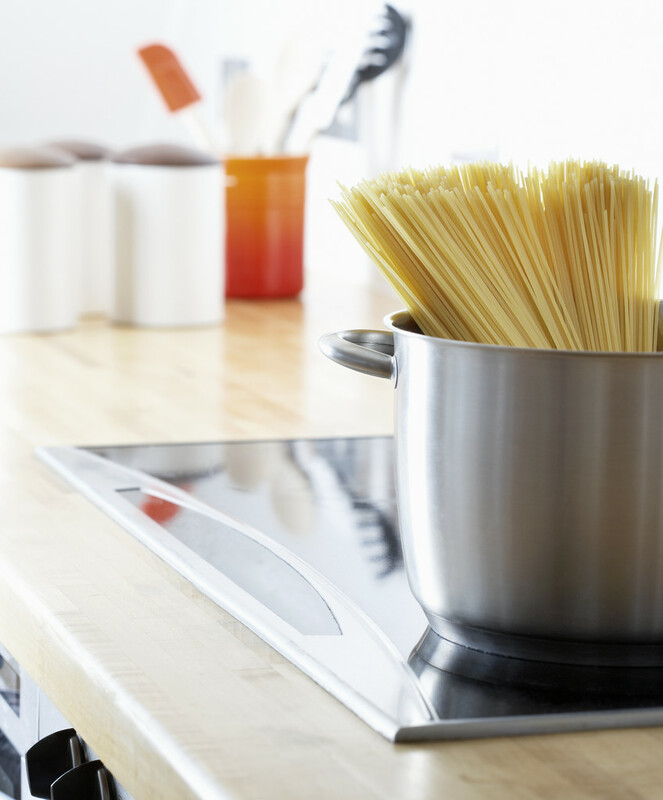 The faster you cook, the less time your clean kitchen is exposed to cooking fumes and oil splatter. Just remember when you remove the cover to check on your food, DO NOT tilt the cover. Steam would have condensed on the inside of the cover and there will be lots of water droplets there. If you tilt the cover, the water droplets will fall back into your hot pan and what you will get is lots of fumes and oil splatter. Hold the cover straight and remove from the pan. Lastly, use a cooker hood! Get the strongest one you can find. It really will help. Please avoid placing your stove next to your kitchen windows or in the service area. I know some people are fond of doing that because it helps to keep the cooking fume out of their houses. I am a victim of such practice. Spare a thought for your neighbours. Just get a cooker hood to deal with the cooking fume. Clean as you go, and you will have less cleaning to deal with after your cook. Do not leave garbage, dirty pots and pans, dishes and utensils all over your kitchen. Do not leave cleaning to the last. Do not allow your kitchen to look like a hurricane just blew through it. Clean as you go. There will always be pockets of time during the entire process where you can quickly clean up and wash up what you have used. Usually, by the time I am done with the last dish, I only have the wok left to clean. A messy and dirty kitchen makes cooking unpleasant. In order to enjoy cooking, clean as you go. One particular point about cleaning is to keep your kitchen as dry as possible. I know that washing and cleaning is part and parcel of cooking. So how do we keep the kitchen dry? Have a cloth close by to wipe your counter top dry as often as possible. I also have a foot rug on the floor next to the sink so that I can use it to mop up droplets of water that dripped on the floor. Why does this help? If you have water on your floor, for instance, it will mingle with the dirty and dust. As you step on the droplets and spread them as you walk around, you will spread the dirty and dust all over your floor. If you have ever walked into a wet toilet with dirty feet, you will know what I mean about leaving dirty marks on the floor. By the same token, if a piece of food happened to drop on the floor, pick it up immediately. Even a tiny little crumb. This is especially important if the food contains oil. If you pick it up immediately, what you will end up with is just a little, indiscernible speck of oil mark on the floor, which can be easily cleaned. If you do not pick up the food, someone will be stepping on it and dragging it around with his feet. Then you will get patches of oily stain on your floor and you will find it necessary to bring out the mop and bucket. With all the drying and picking up of things, it seems like an awful lot of things to take care of while you chop and fry. How can anyone do it? Well, you will learn not to splash water all around when you wash and clean. You will learn not to drop things on the floor. You will learn to mop up and pick up quickly. It will be like second nature and you will do it without even being conscious of it. Sooner or later, you will train yourself to cook cleanly. Having said all that about maintaining a clean kitchen, I want to encourage you to just cook. Your kitchen is meant to be used to bless yourself and your family. The function of a kitchen is to be a place where nutritious meals are prepared. Your kitchen is not meant for you to keep so spotless that it resembles more a showroom than a real kitchen. If we are only preoccupied with keeping the kitchen clean and sparkling, then what is the point of having a kitchen in the first place?